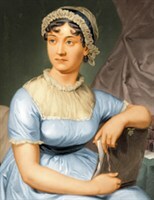 Jane Austen began writing Pride and Prejudice, which was originally titled First Impressions, in 1796; she continued revising it over the next several years. Pride and Prejudice was published anonymously on January 28, 1813. Despite the bias against novels at the time of its publication, three contemporary reviews were unusually favorable. Jane Austen (1775-1817) was the author of six novels: Sense and Sensibility, Pride and Prejudice, Mansfield Park, Emma, Northanger Abbey, and Persuasion. She is known as one of England’s finest novelists of manners. 2013 marks the 200th anniversary of the publication of this timeless comedy of manners. Read this classic favorite and then join the lively discussion. Copies of the book are available for check out at the Library. Registration is not required. Author Kim Wilson will bring Georgian and Regency gardens to life with an illustrated tour of English gardens, from tiny cottage gardens, to the gardens of the grand estates, to the gardens Jane Austen herself knew and loved. Featuring material from Wilson’s book, In the Garden with Jane Austen, the presentation highlights 18th and 19th century gardening and the role which gardens played in the lives and love of Austen and her characters, and reveals the secrets to making your own Jane Austen garden. Registration is required. Eileen Shafer, author of Royal Teas with Grace and Style, guides us through a favorite ritual of Jane Austen's era. Learn how Austen would have prepared tea for her friends and discover how her elegant style and writings correlate to teatime etiquette today. Shafer will treat our guests to a tea tasting of Harney & Son's blends, and will demonstrate how to prepare the perfect cup of tea. Registration is required; space is limited. Pride and Prejudice is a comedy of manners that has delighted generations of readers. Presenter Diane Capitani, Outreach Director of the Jane Austen Society of North America, Greater Chicago Region, will explore how Mr. Darcy got his money, why Elizabeth would have turned him down if money was an issue in her family, and the idea that money—not love—is what makes this novel’s plot keep turning. Registration is not required. Call upon Jane Austen in the autumn of 1815 at her home, Chawton Cottage. Austen’s first three novels, Sense and Sensibility, Pride and Prejudice, and Mansfield Park are published, and Emma is complete. Portrayed by actress Debra Miller, Jane Austen receives you at this, the most vibrant and hopeful time of her life. Drawing from her letters, juvenilia, and novels, this performance delves into the personal life of one of the most beloved and intriguing novelists of the 19th century. Learn about her exotic cousin Eliza, her mentor and friend Madame LeFroy, and the loves and losses that shaped her life and influenced her perception of the world. Registration is required. Batavia High School's AP Literature & Composition Class created a discussion guide for Pride and Prejudice.